In the early days any dog that looked like a terrier with a long coat, silver or fawn colored legs, trimmed ears and a docked tail was recognized as a Yorkshire Terrier. Yorkshire Terriers – how cute are these teddy bear dogs! Yorkshire Terriers appear just like stuffed teddy bears which is why they are often referred to as teddy bear dogs. “Yorkie’s” fall within the “terrier” breed of dog. Simply adorable! The Yorkshire Terrier is also known as a “Yorkie” and originates from Yorkshire, England. They came about in the middle of the 19th century when Scottish workers brought different types of small terriers to Yorkshire in search for work. They were bred by people who worked in the wool and cotton mills. The early versions of this dog were the Skye Terrier and the Paisley Terrier. 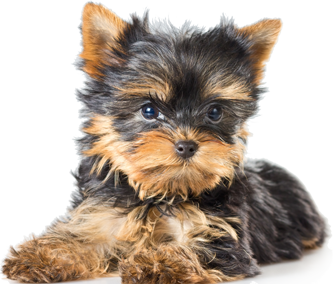 Yorkshire Terriers require good maintenance so that their coat remains silky, straight, fine and glossy. The hair should be long and parted down the middle. From the back of their neck to the beginning of their tail, their coat is generally dark gray or black, and their tail should be darker black still. The hair on their legs, high chest and head should be rich tan and bright. Their coat requires regular brushing to maintain its silky sheen. A Yorkshire Terrier’s temperament is curious, overprotective, active and attention-seeking. They are usually emotionally secure and mentally sound. They are not recommended for families with young children; they are a better suit for older people or families with older children. They are easy to train and they have a nature that flourishes without too much human prodding. In order to learn quickly they need motivation such as praise or food. Yorkshire Terriers are really smart, but they still need mental and physical stimulation. They like long walks and games. When they are tired they like to sleep with their owners. Still, they are individuals and are quite laid back as dogs go. They can easily adapt and they love interaction with other people. When they are in the presence of other dogs they like to stick with their owners. Yorkshire Terriers are generally 8 to 9 inches (20 to 23cm) long and a healthy Yorkie should not weigh more than 7 pounds (~3kgs). This is not constant since they can of course grow larger or smaller, but it is a good guide for how large you can expect your new puppy to grow. The Yorkshire Terrier dog breed generally lives for 13 to 16 years. Is the Shih Tzu a Good Pet for Your Kids?